Our farmhouse is a perfect getaway for couples romantic weekend getaway, away from the noisiness of urban busy life and into a quiet romantic farm stay by the wood fireplace, relaxing in a tropical indoor garden or picnic outside on the beautiful green floral garden with native animals and farm animals. Ideal for girls' weekend or hen's weekend, all rooms are beautifully decorated with vintage and contemporary decors, luxurious bed lining and fluffy white towels. A large island kitchen for all the cooking and baking(European appliances). Bucks' weekend or Boys' getaway is recommended. The farmhouse is 1.8km away from the Grand Ridge road - postcard views along the way for mountain cycling. Also perfect attractions for dirtbike riders with multiple ramps, hills/valleys. The gents would also love to do a bit of trout fishing on the property and then enjoy the barbeque in the open green garden, is also, a win! There are restaurants, winery, picnic area at the State Park, golf course, the beach are all in the surrounding areas. The farmhouse can be accessed on wheelchairs and shower seat is available. I work as a Maths teacher in Melbourne, my husband is a property invester. Having a nice place to get away on weekends is a must for us. We both like open spaces and animals, so we created this farm stay and would like to share it with guests of common interest. Returning guests will receive a 10% discount. Brand new 2018 installed, split system. Upon request. Data usage is at Telstra rate. $10 per 1GB at guest’s expense. Please advice owner at least 2 weeks before check in date. Two dining area. Each with an 8 seater dining setting. Well suited for a few families to spend time away in ambient surrounds - both inside and out. A wood fire heater, inside Zen garden area, spacious living area and many bedrooms/bathrooms - all fully furnished to suit the needs of young and old alike. Adults can relax in front of the Coonara with a coffee from the coffee machine, looking out to the lake and trees, or wander around the garden and relax in the hammock. Children can play with the toys inside, read the childrens books or venture outside to feed the chickens, ducks and pigs. They may get a nice surprise from a few visiting Ilamas and ponies that graze in the paddocks next door as well. 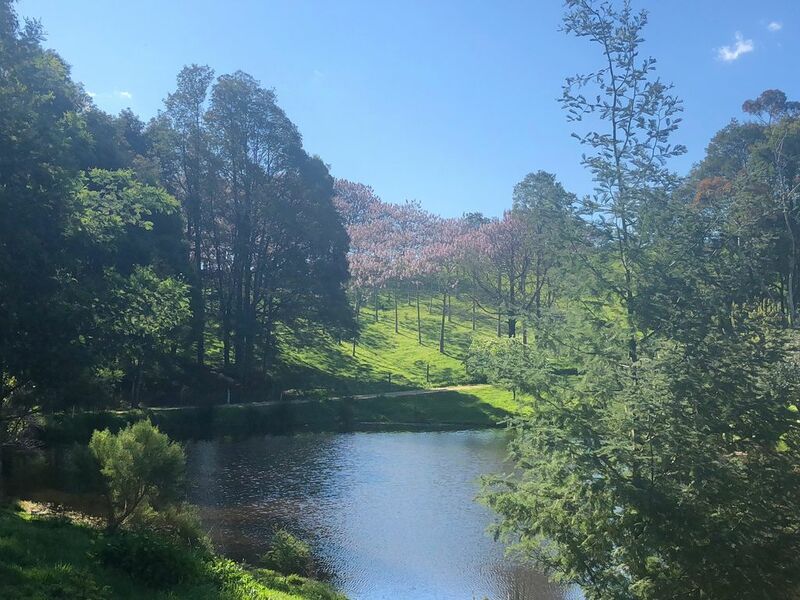 Our three families were able to enjoy all of this in celebrating our Mother's 80th birthday weekend away together, without having to drive too far out from Melbourne. The scenic drive made the journey quite enjoyable. Thanks to the owners, Quynh and Vu, for their input in making the weekend memorable. Would love to do it again! We booked the property for a large group (15 altogether) for family re-union. We had concerns whether the would be enough room for such a large group but were wonderfully surprised that we had ample room for all of us and we had a great time. Quynh personally visited to welcome us and was always prompt in responding our queries both prior to and during our stay. The property was well furnished and tastefully decorated. The surrounding was beautiful and peaceful and we had a wonderful family re-union where we spent most of the time inside the property playing board games, watching cricket (and played cricket too), cooking and relaxing. Couple of days we ventured out to Inverloch (1 hour) and Phillip Islands (1.5 hours) beaches. The kids had amazing time with feeding and playing with the animals (couple of dogs, chickens, ducks, turkeys, pigs and also the neighbor's ponies). Overall, we highly rate and recommend this property for relaxing and enjoying the nature, and spending time with loved ones. Quynh was very helpful. There wasn't a single thing to complain about the property, facilities or services provided. We stayed for 3 nights between Christmas and New Year. Thank you Naomi for a beautiful review and reflection of the property. It was our pleasure to host your family. Naomi and her family gave a lot of care and love looking after the property for us during their stay. We thank your group again for the wonderful stay and choosing us for Christmas break. Was a lovely place to stay with our large family. A great space for all. The property was beautiful to walk around and meet the animals. Completely secluded which was perfect for our weekend away. Indoor sun room was stunning and the house itself is so cozy. Highly recommend and will hopefully be back in future! In love with the Asian vibe and meditation areas. Awesome, spacious, great set out, beautiful outdoor area, fully equipt kitchen, everything and more we wanted for a weekend getaway with a large group of people.